Which is all good – but how do you elevate your wedding day into something really, truly special? Well, this is why it’s time to give an insight into how Silk Street Jazz can add some real pizzazz to the day. We don’t want to explain what we could do, but by actually showing you what we have already done for another happy couple. Jayne and John had their own special day last month. The wedding was in Birmingham with the day’s celebrations being divided between two venues near to each other. The ceremony itself took place on the top floor of the Regis Hotel. The wedding breakfast and reception were held at the nearby Blue Piano Guesthouse, Restaurant and Bar. For this particular booking, Silk Street Jazz provided the element of surprise as well as great music. The booking was actually arranged by the sister of the bride as a special surprise. The band waited in the foyer of the hotel as the bride and groom descended in the elevator, blissfully unaware of what was in store for them! 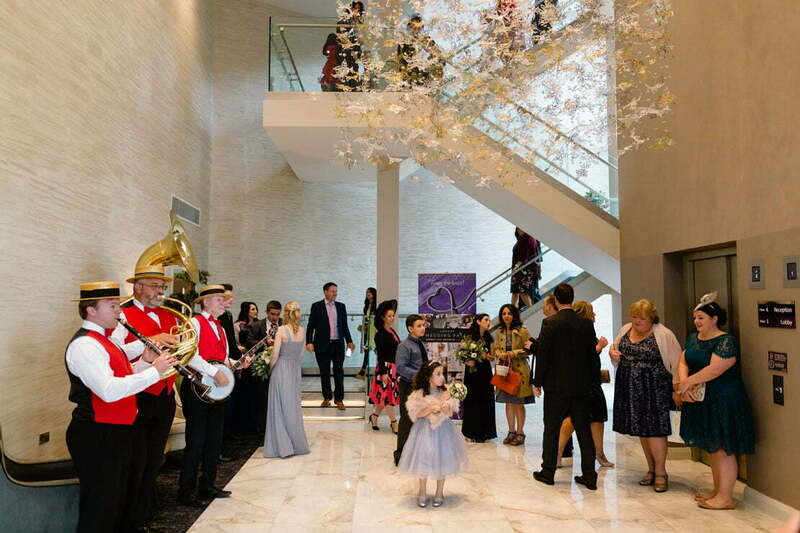 As soon as the lift doors opened, Silk Street Jazz started to perform – a complete surprise for the happy couple. Now, under normal circumstances, the journey by foot from the Regis Hotel to the Blue Piano would involve a walk through the subway. On Jayne and John’s special day it still did – but it was anything but normal! Instead, a pretty uneventful walk was transformed into a grand wedding procession. The band led the party in procession, performing upbeat and celebratory wedding songs, such as Ain’t She Sweet, Charleston, When The Saints, and All of Me. Guests’ feet were tapping, hands clapping and everybody had a smile on their face singing along. So, what would have been a pretty uneventful period of time became something really quite special and enjoyable for all concerned. It also served as a lovely way of linking the ceremony to the reception. 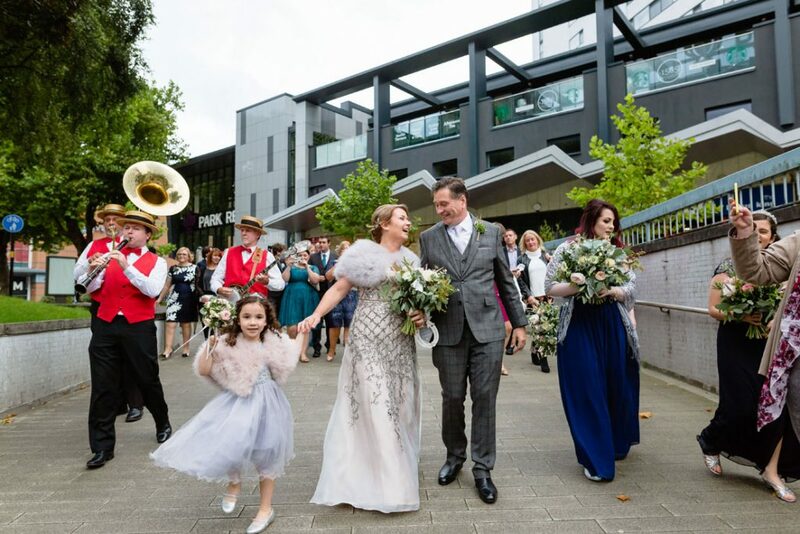 Once everyone had gathered at the Blue Piano, the bride and groom posed for photos outside the restaurant, the band then paraded in as guests grabbed champagne from the trays. Being an acoustic act – this time in a line-up of clarinet, banjo and sousaphone – the band was fully mobile. We performed all around the restaurant and outside on the terrace/patio area. Of course, being acoustic, we led the procession without wires! It also minimized set up time at each venue. There were no trailing power leads anywhere to be seen! As you can see, the day was captured for posterity with some truly exceptional photos taken by Paul Pope Photography. You can see more great photos from Jayne and John’s wedding here. Now, not all wedding days will benefit from a procession through a subway! However, if you want to add that special something to your special day, just call 0800 756 5512 for a chat. You can also get in touch with us here to see what we can do for you.